Pranava-Naadham founded in the year 1992 and led by V.L.V.Sudharsan, Violin artiste, blending the entire three major systems of music (Carnatic, Western & Hindustani), have toured all over India and presented the fusion concert which was greatly welcomed by the public. This troupe consists of 7 members. During late 80’s and 90’s Jugalbandhi was popular which means two different system of music will be performed on the same platform, thus we music friends thought why not western music system could be added along with Carnatic and Hindusthani and fuse and blend with melody as main stream and perform, as a result we formed a group named “Pranavanaadham” The instruments itself will represent the respective system. The details are as follows. The creation of this universe is based on the principle of “OM” the pranavam. 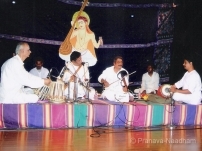 The compositions played by this pranavanaadham group in each concert also forms the basis of pranavam the “Om” and the theme of the concert signify the occasion meaning the concert will be planned according to the occasion.This troupe ensures to play any one krithi in a concert composed by Saint composer Tyagaraja on Nadam which is the embodiment of lord siva,There are about 13 songs composed by the saint which elucidates the naadham in detail. Even the troupes name Pranavanaadham also suggested by the saint in his saramathi Raga krithi “Mokshamu galada”where he speaks about ‘Pranavanaadha saptha swaramulai parage’ thus we are 7 members taking part.The tunes by itself reveal the theme according to the titles. like joy of rhythm, Ragatayamalika varnam, Just born, Chameleon, marriage medley,Travel in the desert, Made for me etc..the special mention of the Ragatayamalika (sruthi beda varnam) shift of tonic which often used in western classical music moreover this is a kind of progression which one loves to have it in their life always,the composition also suggests the gradual raise in sruthi in the basic scale of sankarabharanam,the other ragas which follows the basic sankarabharanam raga are Kharaharapriya, Todi, Kalyani, Harikamboji and Natabhairavi.the speciality of this composition is logical increase in sruthi and resulting in different raagam. Pranavanaadham released two albums namely “Trendz” & “Breath ecstasy”. During the year 2000 December music pranavanaadham presented Concert(Fusion) for the inauguration of The “Margazhi mahotsav” under the auspicious of Bharat Kalachar, which was magnificently reviewed by “The Hindu” the daily news paper. The “Pranavanaadham” troupe is grateful to “Sarvani Sangeetha Sabha” For providing an excellent opportunity to present the concert (fusion) During Music season, 2010. “Pranavanaadham” Is fortunate for having been selected by ICCR, New Delhi, an esteemed organization,Government of India,( Indian Council for Cultural- -Relations)as Carnatic Fusion(Group) for empanelment in the ICCR’s Reference panel of Artistes. Sabhas,organaisations,Instutions,Social gatherings, Marriage receptions,Parties,Doordharsan,temples,Thematic concerts,Group orchestral support for special vocal concerts,etc…some of the Prestigious sabhas to name a few 1.Sarvani Sangeetha Saba.2.Nungambakkam cultural Academy.3.Bharat Kalachar.4.Laya Sruthi,Pondicherry.5.Raja sr.Muthiah muttamizh Manram,Annamalai University.